Since my girlfriend was busy raiding on an alt with her guild, I didn't form a heroic raid, but joined one. Then another. And another. Most of the heroic raids just fail. But after two hours of hopping: Yep. 4 people alive and the killing blow as my lava burst. Also, I got heal #1. So happy me. Especially happy for my progress: 4300 guilds are about 80-100K raiders. Out of 10M players, that's stable top 1%. Not bad without having a guild and raiding only with randoms. Unfortunately Brackenspore lived because they didn't listen to use 3 tanks. The add just killed tanks and people were calling the overwhelmed tanks idiots which ended in the expected way. PS: how did Blood raiders get on this kill? PS2: I believed it to be RMT success. But then commenter informed that it was genuine moron. Blood Raiders (And rats) occassionaly appear on gates, and rarely, stations. Yup. Init's got no sov at all. The answer to your question about blood raiders being on that kill is something you might know if you lived or worked in null regularly. NPCs spawn at gates. It's likely that the freighter got caught at a gate and they pegged him a few times. Though bragging about it is a little bit like bragging about being able to pug Patchwerk back in WotLK. 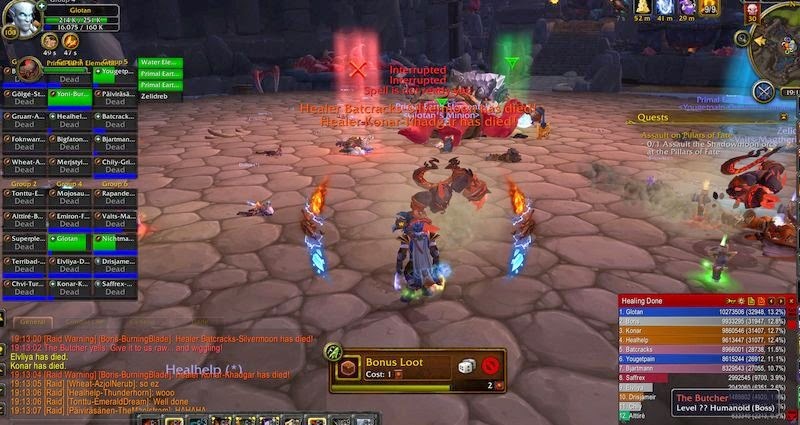 If you get Kor'agh hc down in a pug within a week or two, then i'd be impressed. @maxim: you have wrong perspective. 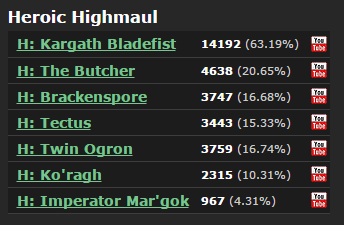 While Ko'ragh is definitely harder than Butcher, Butcher is already top 1%. Maybe not impressive to someone who has 7/7 Mythic, but it is for 99% of the players. "The add just killed tanks"
= DPS not doing their job. My perspective is not the same as that of 99%, but that doesn't make it "wrong". Killing Butcher hc in a pug is not impressive and is simply a matter of lucking into a somewhat geared group. Well, unless your goal was to impress the 99%... Then allow me to redirect you to your own post on "ultimate power"
"impressive" isn't an objective term, so one cannot be impressive. "Impresses maxim" is a completely arbitrary criteria, fully under your control. You can choose to be impressed on anything you want. Trying to "impress maxim" is equal to "be the slave of maxim". If the point of this "I AM BETTER THAN 99% OF WOW RAIDERS" was not impressing anyone, then what exactly was it? I agree that, by this objective observation, you had more success raiding with a pug selected under a slight bias towards healers / tanks and ready to replace its members at the drop of the hat, than 99% of organized groups out there. Only... Why should anyone even consider people who think organization is kind of like a random flock of sheep getting together and getting herded somewhere? All guilds i know if that actually have a member pool to replace underperforming people from are 2/7+ in mythic already. They also don't need to spend hours failing on raids just to luck into something reasonably geared/skilled. @maxim: what I'm trying to prove is "socialization is mutually exclusive with having and enforcing standards". You might noticed that fighting socials and their favorite activity is kind of theme here on this blog. A random PuG is an ideal a-social environment, so its success over social groups is the ultimate proof of my ideas. 1) Your inability to convince people that you are right without telling them to go raid some Mythic does not make you right. If anything, it kind of undermines your entire point. 2) You should be able to answer this by saying that, yeah, but these people clear a whole heroic-raid in literally one flask's worth of duration, while you are struggling with random crap that is not even gameplay. To which, you obviously hear the answer that essentially boils down to "There is more to gampeplay here than maxing raiding efficiency". And then you run into a wall, because you just can't seem to accept that it is perfectly okay for every player to decide on his own the worth of his time in game, without adhering to anyone's standards (including yours or the game creator's). 3) Socialization is a big part of mythic raiding, actually. It is not like all of us get paid for every bosskill. Gotta get compensated somehow. Warm fuzzy feelings that come from being in a group of superior players and socializing around said superiority are the compensation for most people. 4) You are trying to measure success of a PUG, the only raison d'etre of which is clearing a raid, against social groups that have other goals. @maxim: you misunderstood me. I meant I can't say to people "go Mythic", but I can say "go PuG". And for 99% of them going PuG would mean faster progression than being in a social guild. We can argue forever if Mythic guilds are social groups or performance-oriented who socialize in idle time, but it doesn't matter. 1723 guilds killed ONE boss in Mythic. That's about 40K players. 0.5%. Whatever the key of their success is clearly a minority thing that can't be generalized. On the other hand PuGging can be generalized. With other words: only a small elite can be in a Mythic guild, but most people could PuG and progress much faster than they do now. But the curious thing - people don't want to go pug and choose worse performance over more purples. Now, what is it they are finding in their guilds instead that prevents them from taking this move to pugs? And maybe this thing thing that they find is more important than virtual pixel progression? No matter how objectively measurable pixel progression is? 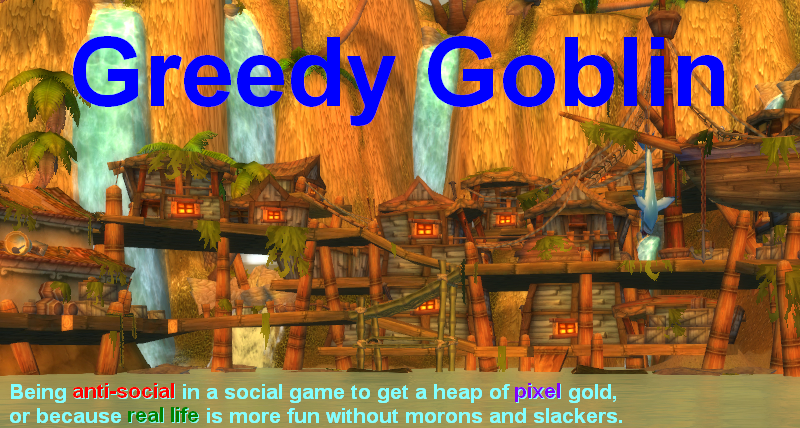 Your message seems to be this - if you want more pixel progression, then pug is better than 99% of guilds out there. To which i answer - any guild that kills at least 1 boss in Mythic is already miles ahead of any pug at the moment. And the goblin is lying when he says you can't get in.